To date, there has been nothing in my life that caused me more pain than when I had my heart broken by someone that I loved. The day he came to my home and told me that although he “loved me, but he wasn’t in love with me” sent me spiraling for months with many Sunday afternoons curled up on the sofa in tears. But now I know why he left. My client Melissa was in a relationship for 22 years when he told her that he had met someone else and left. My client Lara was in a relationship for 14 years when he told her that he could no longer see or speak to her any longer; that it was just too painful for him. My client Carrie was married for 27 years when her husband came home and told her he no longer wanted to be married. My client Beth was in a relationship that, albeit much shorter, was no less intense and this strong, confident, vivacious woman found herself in tears curled up on her kitchen floor when her boyfriend told her that he just couldn’t be with her any more. Most didn’t really understand why he left. 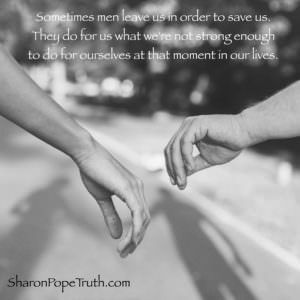 Sometimes men leave us to save us. They left us because they could do the thing that we were not strong enough to do for ourselves. Now, don’t get me wrong….they didn’t do this consciously (in their minds it was for them and Lord knows we don’t want to give them too much credit for this), but they did for us what we couldn’t do for ourselves at that moment in our lives. In each of these cases, the relationship wasn’t a good one; in fact, in hindsight, most were pretty toxic. Each of us hung in there much longer than we should have, trying to make it work. Each of us accepted actions and behaviors that we should not have, at times believing we could love him enough to change him. Each of us abandoned our hearts more than once in an effort to hang onto what was not ours. I coach women in heartbreak attempting to find themselves, their hearts and find their way to peace (which by the way, is all the same destination) because it’s important work; nothing will bring you to your knees faster than heartbreak. I coach women who really want love in their lives but haven’t been able to attract or sustain it because healing the past and finding love is not just a simple, intellectual exercise; matters of the heart never are.